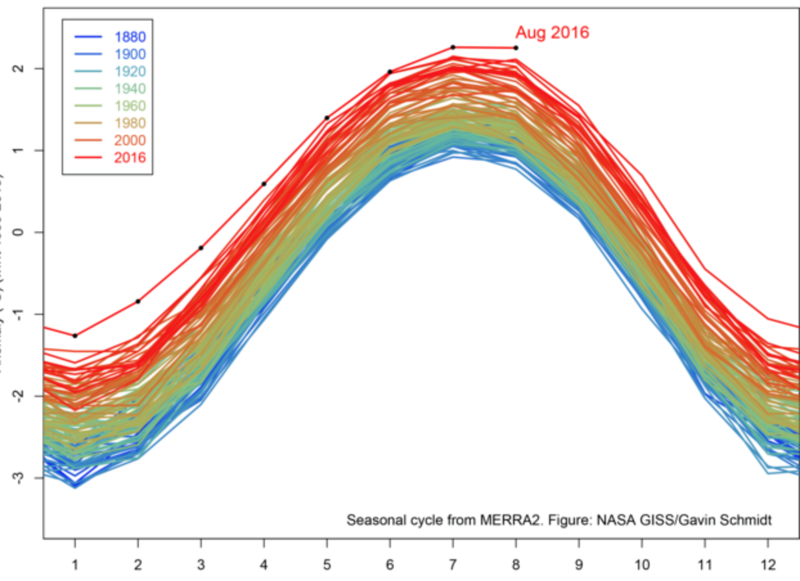 The record: August 2016 was the hottest month measured since contemporary records began in 1880, according to a NASA analysis. It was not only the hottest August ever, but also it ties July 2016 as the hottest month ever—an extraordinary occurrence. In other words, you just lived through the hottest month in meteorological history and likely in human history. And then you did it again. The August record was last broken in: 2014. Why it’s so scary: There are three big reasons. First, it’s the 11th straight month to break the previous monthly heat record, according to NASA. In other words, in 2015, the hottest October ever took place, and it was followed by the hottest November ever, and then by the hottest December ever—and this sequence continued right up to the present. Finally? What might be scariest of all is that only one of the two main candidates for U.S. president has a detailed set of policies to address climate change and these longterm trends. Donald Trump isn’t sure climate change exists—and his party refuses to fund climate-change adaptation even when the Navy begs them to. And even worse, climate change doesn't seem to be of interest to those who are coming up with questions for the presidential debates coming in September. But how far behind are we? I guess he pretty much is a Canary. In his own cold mind.